Romney's Foreign Trip Hits Right Note For Some, Potholes For Others : It's All Politics Mitt Romney's trip abroad accomplished some of what he wanted. In Israel he delivered a hawkish pro-Israel message of support for the conservative government meant to appeal to those U.S. Jews skeptical of President Obama. But his trip also had missteps, notably in Britain but not only there. 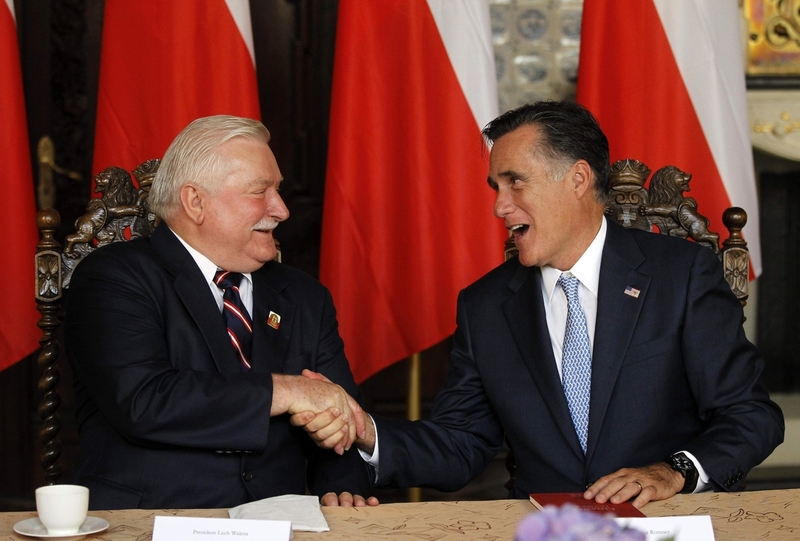 Mitt Romney, right, meets Monday with former Polish President Lech Walesa in Gdansk. As Mitt Romney nears the end of his seven-day trip abroad, it's safe to call the results mixed at best. The trip to Great Britain, Israel and Poland had several goals. It was meant to show that Romney has the gravitas and acumen to be this country's top foreign affairs policymaker; to remind U.S. voters of his success running the 2002 Salt Lake City Olympics; to appeal to certain voters in battleground states, especially Jewish and Catholic voters of Polish heritage, and to raise campaign cash. As anyone paying attention to the all-but-official Republican presidential nominee's travels knows, the start of Romney's trip was far from ideal. He managed to insult his British hosts by initially expressing doubts about the eventual success of the London Olympics. Even after Romney distanced himself from those early impolitic remarks, the British media wouldn't let go of the perceived diss. Success was certainly not the the word many observers attached to the London leg of the trip. Fortunately for him, the next stop was Israel, a country led by longtime friend. Prime Minister Benjamin Netanyahu, whom Romney has known since both worked as management consultants in Boston as young men, gave the American the expected warm reception. But the Middle East is such a mess of political, ideological and geopolitical booby traps that it routinely causes U.S. presidents to stumble. Presidential candidates are no different. First, Romney's campaign had to back off comments made by adviser Dan Senor, who appeared to suggest that Romney would be OK if the Israelis launched a unilateral attack against Iran to keep it from being able to make a nuclear bomb. "The Romney statements on Jerusalem and the racist statements about the Israeli culture being superior to the Palestinian culture reflect someone who needs to be educated, who needs knowledge. His statements are serving those extremist in the region now, and will serve extremists unfortunately." Not that Romney didn't accomplish some of what he wanted to in Israel. President Obama has been viewed skeptically by many Israelis and American Jews who perceive him as a less stalwart ally than his predecessor. "The speech also got good marks from analysts. 'I thought it was excellent,' [said] Hannah Diskin, a professor at Hebrew University. 'He really doesn't hesitate to go with it and show that he's a real friend of Israel.... As soon as he started talking... he pushed all the right buttons, saying everything that Republicans in Israel could have wanted him to say." As Harvard professor Stephen Walt notes in blog post on the Foreign Policy web site, when it comes to Israel and the U.S. Jewish vote, Romney is far from the only politician who says what the intended audience wants to hear. The Republican's Israel visit was intended to shake loose some of Obama's support among Jewish voters. A recent Gallup poll showed Obama favored by about 68 percent of Jewish voters, roughly the same numbers enjoyed in 2008. The trip was also intended to raise a lot of money. Sheldon Adelson, the billionaire casino owner who staunchly supports Israel's conservative government, hosted a $50,000-a couple fundraiser for Romney at the historic King David Hotel in Jerusalem. The Daily Forward has a colorful report on the scene at the hotel during the Romney-Adelson fundraiser. Poland, the last stop of Romney's foreign tour, was meant to do a few things for Romney. One, his visit there would allow him to make a play for Catholic voters with ties to Poland in several U.S. battleground states. "The states that hold the largest communities of Polish-American voters overlap significantly with this year's swing states. Michigan, Pennsylvania, Wisconsin, and Ohio all are home to numerous voters who trace their heritage to Poland, according to John Kromkowski, a Catholic University professor who studies urban and ethnic politics.
" 'They're not only in swing states, but over the decades that I've been tracking this, they're also swing voters,' he said. 'It's sort of a mixed population, so it's an almost archetypal swing vote.' "
In Poland, Romney could also signal through his visit that he would be a better friend to that nation than Obama. The president's relations with Polish leaders were frayed by his decision against following through on his predecessor's plan to deploy a U.S. missile-system in Poland. It hasn't helped that the Poles viewed Obama as trying to mend U.S. relations with Russia at Poland's expense, as laid out in a Foreign Policy piece. The Polish visit also allowed Romney to associate with an authentic national hero of global stature, Lech Walesa, the electrician who became the best-known leader of the Solidarity trade-union movement that hastened the downfall of the Soviet-led government in 1989. "Lech Walesa, the Nobel Prize winner and former Polish president, effectively endorsed Mitt Romney for president here Monday.
" 'I wish you to be successful because this success is needed to the United States, of course, but to Europe and the rest of the world, too. Governor Romney, get your success, be successful!' Walesa said through a translator following their joint meeting in Gdansk." "In relation to Lech Walesa's meeting with Mitt Romney, a candidate for President of the USA, I wish to inform that NSZZ 'Solidarnosc' is in no way involved in the organization of this meeting nor had the initiative to invite Mitt Romney to Poland. "Regretfully, we have learned from our friends in the American trade union central AFL-CIO, representing over 12 million workers, about Mitt Romney's support for the attacks against trade unions and labor rights. In this respect, I wish to express, on behalf of the President of NSZZ 'Solidarnosc' Piotr Duda, our solidarity with American workers and trade unions. NSZZ 'Solidarnosc' will always support the AFL-CIO in their struggle for the right of workers to organize and bargain collectively. In any event, while the results of Romney's trip abroad were uneven, the 2012 election isn't likely to be decided by foreign policy unless something unforeseen reshapes the contest. "But regardless of how stately and diplomatic, or amateurish and clumsy he appears, or how much he talks about the supposed foreign policy errors and failures of the president, who still wears Bin Laden's scalp on his belt, it will have little meaning for the outcome of the November election. The presidential election is a referendum on Obama's domestic policy record. It will be largely decided by the major themes of the economic situation and outlook."